The capital of the prefecture in Nagoya　名古屋. 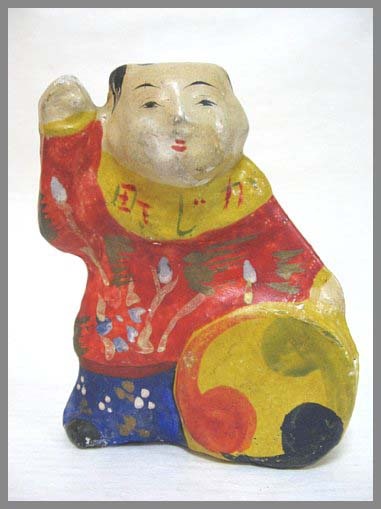 Clay doll is the general term for the dolls made from clay. 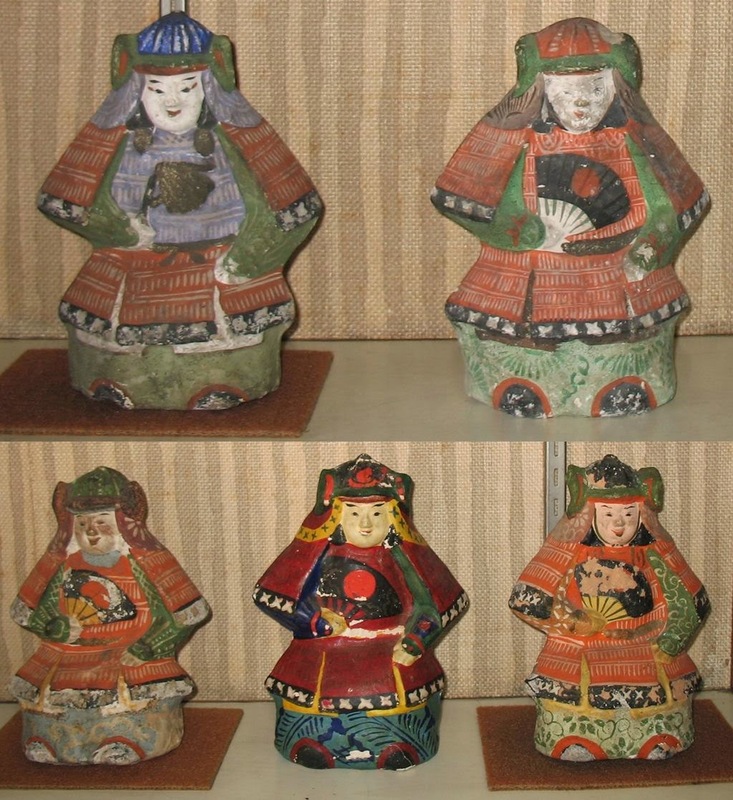 In Aichi prefecture, clay dolls have made in Nagoya, Ichinomiya, Inuyama, Hekinan, Handa, Tahara, Toyohashi and Toyokawa until the middle of Showa era. 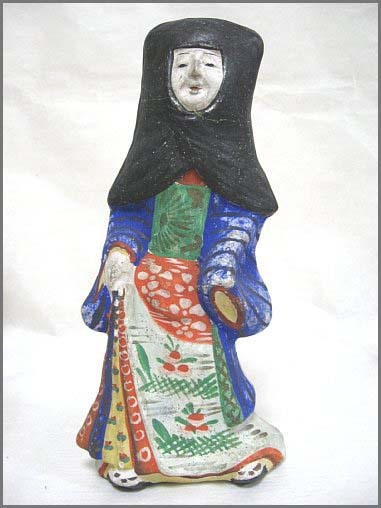 Especially in Hekinan area, famous for tile manufacture, the ridge-end tile craftsman called “Oniitashi” made the mold of clay doll and prospered for the district of clay dolls. 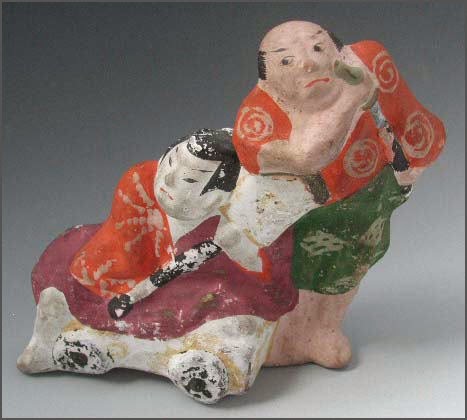 This exhibition shows about 200 items of clay dolls and molds from Aichi and environs area. 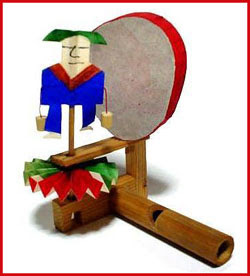 We introduce arious topics such as the way of the seasonal festival decoration and how to make clay doll. 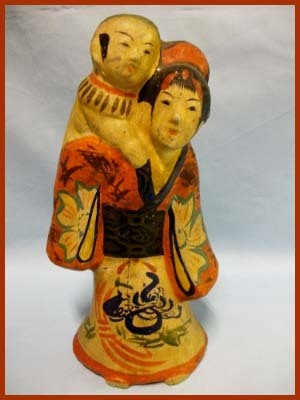 You can feel the parental love which prays about grow up in good health of children through clay dolls. 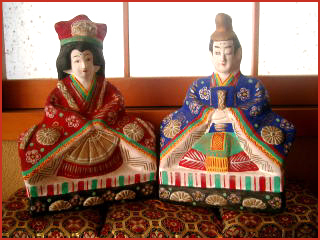 We are glad if you enjoy the way of the seasonal festival decoration in different area and the various clay dolls. 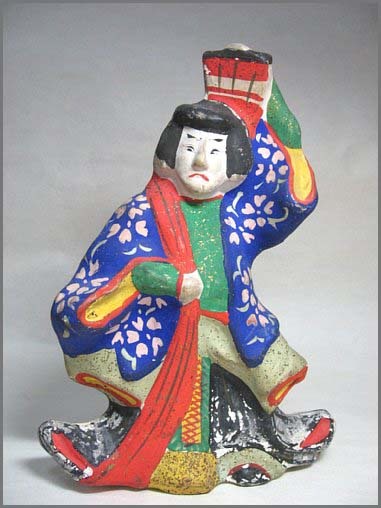 The origins of this ware date back to an earthenware called 須恵器 sueki that was made about 700, during the Nara period (710-794), although the traditional skills, techniques and nomenclature of Akazu Yaki that are still in use today were established during the early years of the Edo period (1600-1868). It was the period slightly prior to this that saw the establishment of glazing techniques that are still in use, namely 志野 shino, 織部 oribe, 黄瀬戸 kizeto, and 御深井（おふけ ofuke. In all, seven main glazes are in use. 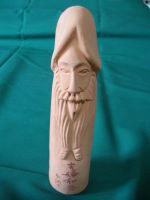 In addition to this some 12 different techniques are employed, including herahori in which a modeling tool is used to make a pattern on a formed piece. Then for inka, motifs are created using a stamp after forming in a mold. Using a bamboo or metal skewer, parallel lines, wavy lines, spirals, or a pattern of dots are made on the clay while the surface is still soft for kushime. For mishimade using a technique coming from Korea, a pattern of chrysanthemums is created in a white slip wash on a dark grey ground. 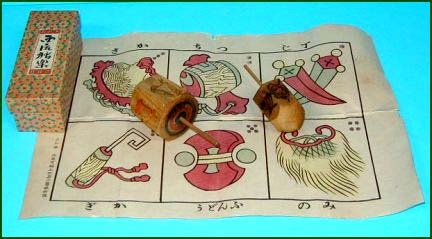 Making full use of these techniques, tetsu-e decorations, which have been in use since the Momoyama period (1573-1600), are added in iron. 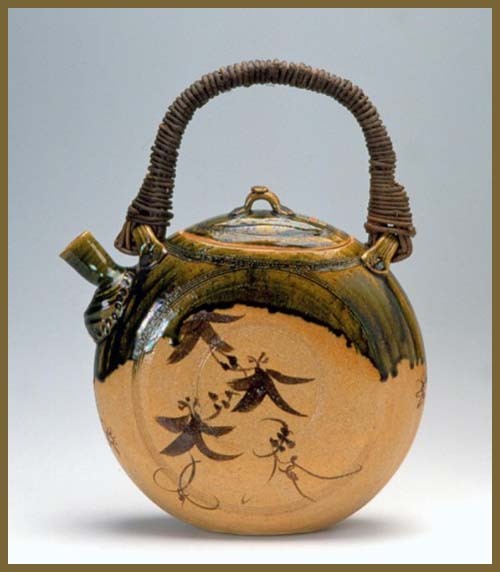 Today, items associated with the tea ceremony and for ikebana are among the main pieces made along with various kinds of dishes to be used at top quality Japanese restaurants and in the home. All are highly praised by specialists as hand made articles of the very best quality. 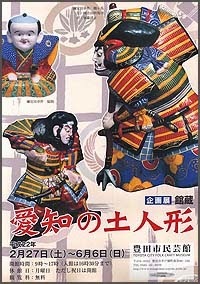 They have a strong influence from the Inuyama dolls and Kuboishiki dolls 久保一色 . This doll is about 26 cm high. 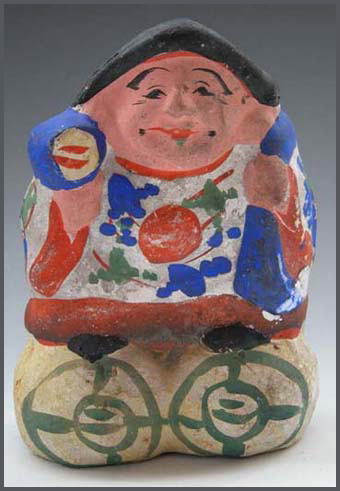 Clay dolls made in 小牧市久保一色 Kuboishiki village, Komaki town.
. hachimaki Daruma 鉢巻だるま Daruma with a headband .
. hatobue 鳩笛 dove flute, pidgeon whistle . Writings on the fireworks in Yoshida (the former name of Toyohashi) have been found in the archives of Yoshida Shrine. ..... Fireworks in Yoshida only started to become as impressive as the current Gion Festival fireworks after the City was reformed during 1688 to 1704. 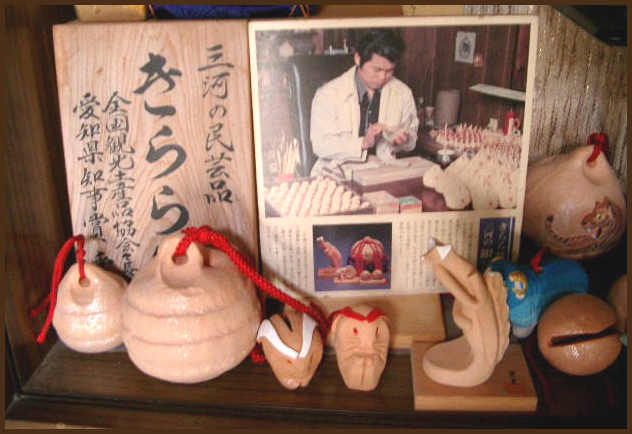 ..... ll around Yoshida were shrines dedicated to fireworks festivals in the same way as Yoshida Shrine. Utari Shrine in Kozakai Town, Hoi district and many other shrines in other districts competed to produce the best fireworks. Designs unique to certain areas became apparent, and the blue, red, and yellow fireworks that are so popular today all come from the works of firework manufacturers of the Toyohashi region. To this day, fireworks are still widely used in festivals and events, weddings and other ceremonies, proving that this region is the real home of fireworks.
. Inu Jinja　伊奴神社 "Dog Shrine" Ema and Amulets .
. kodomo sanbasoo 子供三番叟 child performing Sanbaso .
. Shiokumi 汐汲　人形 Shiokumi Dance Doll "Salt-scooping girl" . 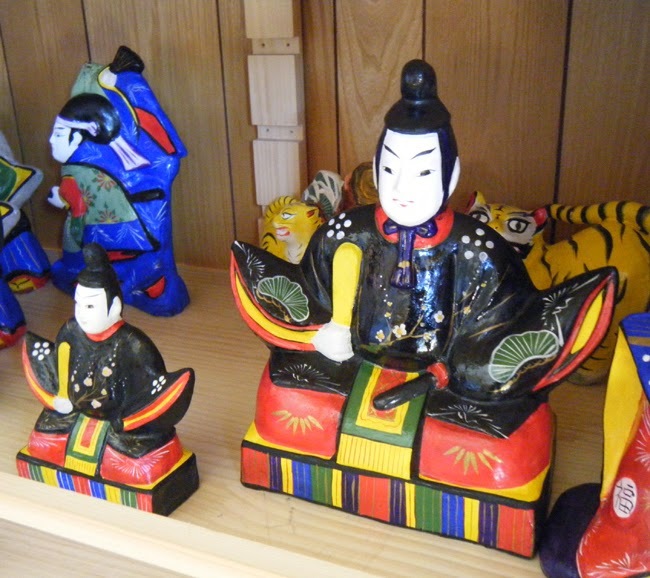 A lot of kabukimono have been done in the Mikawa area of Aichi. A special scarf and hood used in winter to keep warm.
. 秀吉と三法師 Hideyoshi and Sanboshi (Samboshi) .
. Kajiwara Genta 梶原源太 / Kajiwara Kagesue 梶原景季 .
. Yaegakihime 八重垣姫 Princess Yaegaki-Hime . "If only I had even a bokuto (bokutō　木刀) ...". 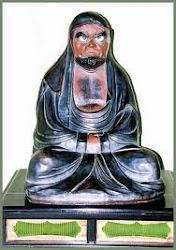 Noma Daibo, or formally named Omidoji Temple, is a temple belonging to the Shingon sect of Buddhism. Its history dates back to the era ruled by Emperor Tenmu in the middle of the 7th century. is famous as the place where Minamoto no Yoshitomo, the father of Yoritomo and Yoshitsune, was killed unarmed when he was taking a bath. In 1159, Yoshitomo was defeated by the Taira clan in the Heiji Rebellion and escaped from Kyoto, heading for the east via Mino province and Chita Peninsula. In the village of Noma, Yoshitomo stayed at the residence of Osada Tadamune, Yoshitomo’s retainer Kamata Masakiyo’s father-in-law, who betrayed Yoshitomo for the reward from the Taira clan and killed him in the bathroom. 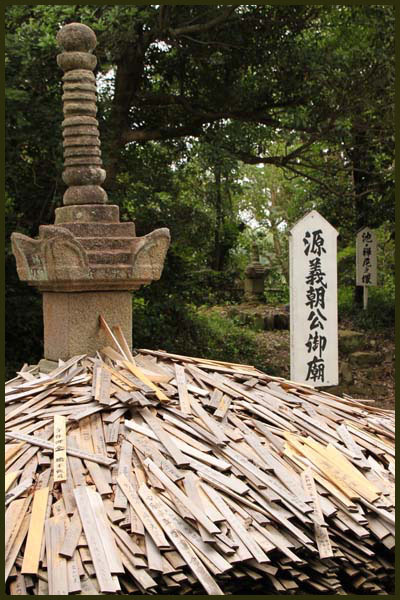 It is also believed that one who dedicates a wooden sword here will have his prayer answered. where the betrayers washed Yoshitomo’s head, and the ruins of the bathroom also remain in the precinct.
. Osadagani Osada crabs 長田蟹, Osadagai 長田貝 Osada shells . and the curse of the Osada and Heike family.
. Kira no aka uma 吉良の赤馬 red horse from Kira . made by 松田さん Matsuda san and others. 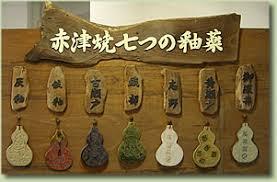 In the mountains of Mikawa a lot of unmo (kirara) 雲母 mica was found since the times of Kira Kozukenosuke and earlier. Yatsuomoteyama 八ツ面山 was especially famous for it, and mica from this mountain was even delivered to the Imperial Court in Kyoto. But during the work in the mountains there were also many human deaths by accidents, and thus it was stopped eventually. To appease the souls of the dead workers, 加藤熊蔵 Kato Kumazo was the first to make this shimmering kirara bells. They were hung on the trees of the path where the funeral procession was walking. for the Tenteko festival てんてこ祭り. 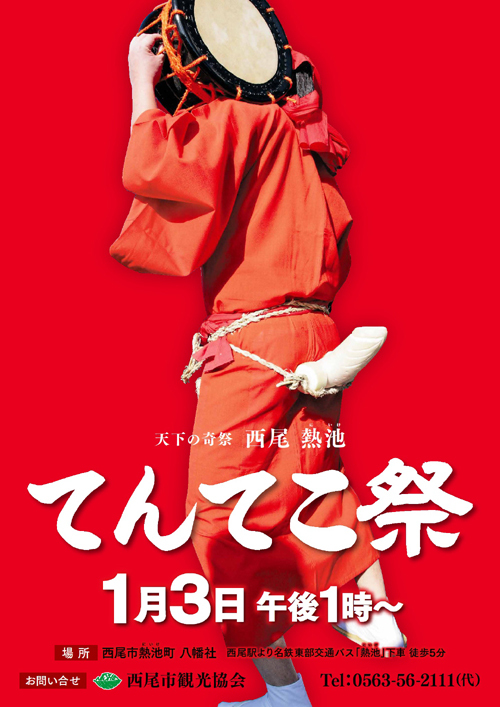 An annual Tenteko festival held on January 3rd to pray for an abundant crop yield. The festival is said to have started in the Heian Period. 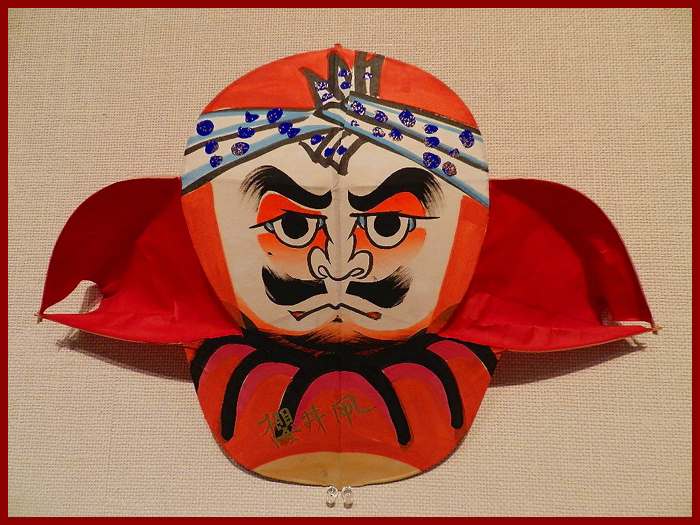 Yaku-otoko (men of an unlucky age) wear a red costume and hang a daikon radish from their waist as a symbol of masculinity. They then march through the town and shaking their hips, accompanied by the sound of drums. 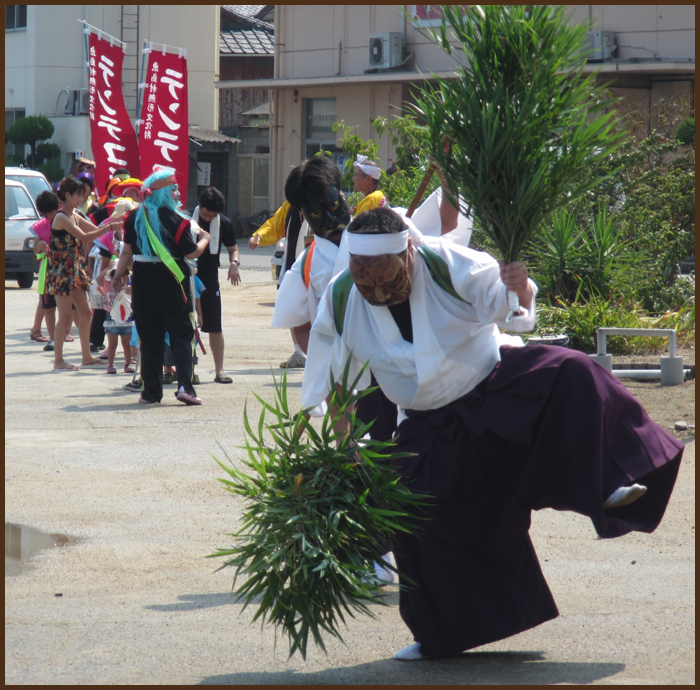 In 魚島村 Uoshima village the テンテコ踊り Tenteko dance is held at O-Bon, the Ancestor festival. People take home on branch of the bamboo grass and hang it at the entrance of their home to ward off evil in the coming year. Nexty year they float this tenteko sasa branch in the sea and get a new one. Its arms are quite thin and easy to break off, so they are difficult to fire. 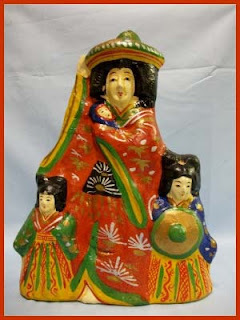 They show a mother and fox baby and are often a present for a pregnant woman.
. Karakuri ningyoo からくり人形 Karakuri mechanical dolls . five-colored bells from shrine Susaki jinja . 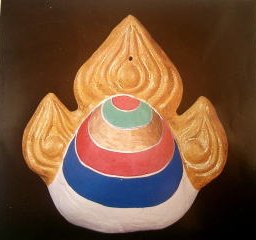 sacred rooster of the wild Sanbo Kojin deity . horse head from temple Ryusen-Ji . 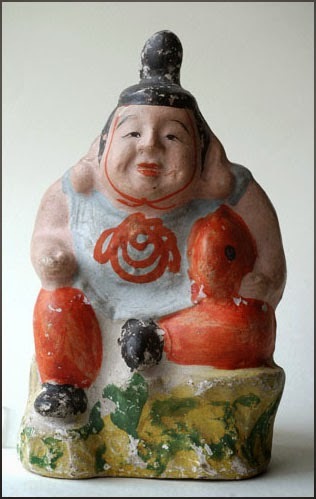 takeuma, take uma　竹馬 "bamboo horse"
She is the mother of Toshitsune 義経の母. 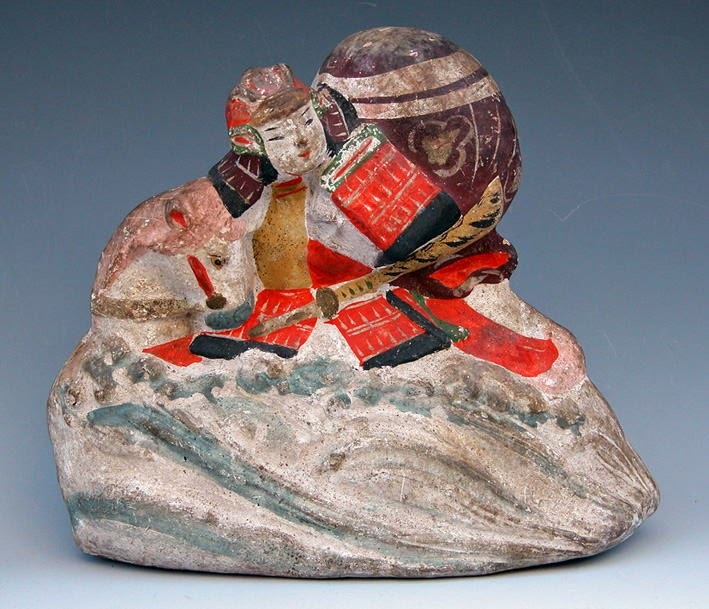 Here she is shown fleeting from the 平家 Heike forces.
. Kato Kiyomasa on a tiger 虎乗り清正 .
. Okkawa tsuchi ningyoo 乙川土人形 clay dolls from Okkawa . The reading of the characters varies. 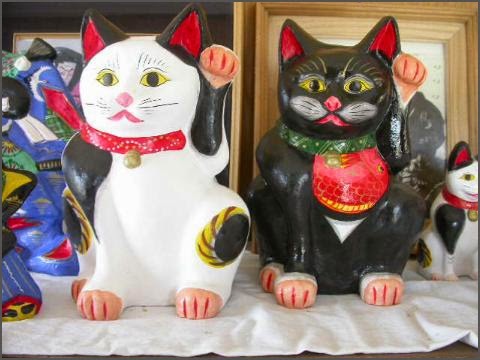 The repertoir is classic, Manekineko Beckoning cat, Tenjin sama, Yoshitsune and Benkei, Fukusuke etc. He follows in the footsteps of his father. KORYU-SEMI has a very excellent feature to fly stable at strong wind speed at 8-15m/sec. It is very difficult to build KORYU SEMI because it needs a special sooty bamboo for its frame, Washi(Japanese paper) and excellent technique and experience to build. 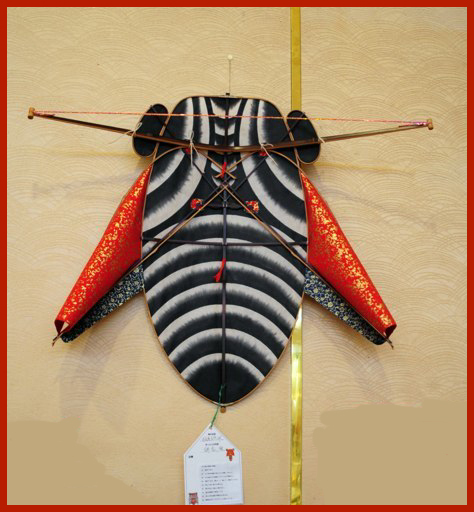 KORYU means old style and SEMI means a cicada. Those are a horsefly (Abu) type, a cicada (Semi) type and a bee (Hachi) type in their configuration. The Nagoya Koryu shows an excellent flight feature in a strong wind such as 5m/s to 15m/s and have a hummer with high pitched sound. Although the height of the kite usually does not exceed more than 60 cm, the flight stability in the strong wind is very excellent. The building technique is very difficult because it needs a superior craftsmanship and experiences. Mr.Masaaki Satoh is an outstanding kite builder of Nagoya koryu.
. Tanao ningyoo 棚尾人形 Dolls from Tanao .
. tora dooji 寅童子 Tora Doji doll and Tokugawa Ieyasu .
. Toyohashi ningyoo 豊橋人形 Dolls from Toyohashi .
. Utari Jinja　莵足神社 .
. Shooki no men 菟足神社の鍾馗面 Mask of Shoki .
. Aichi Folk Toys - this BLOG .